(1971) Pinocchio Italian Restaurant, Burbank | Remains of L.A. 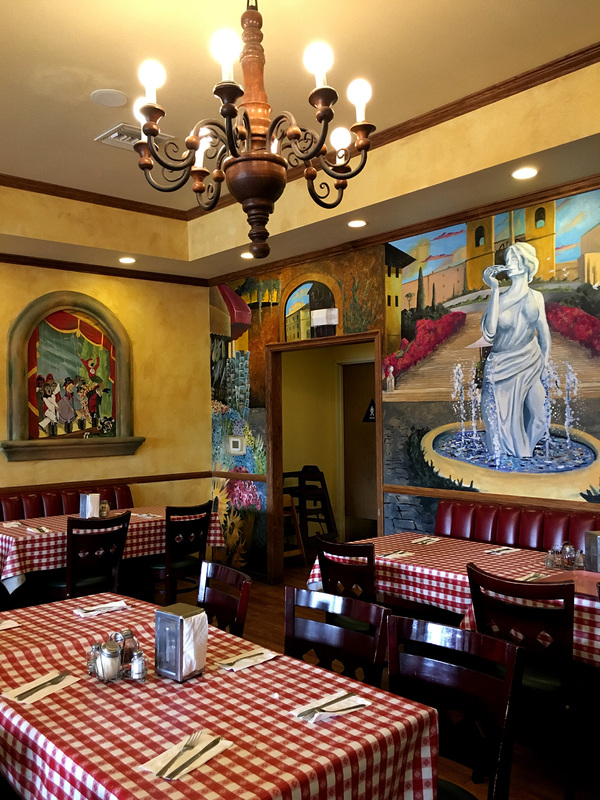 I went to Pinocchio Italian Restaurant in Burbank for lunch. I’d been there before, years ago, and really liked it, and always meant to go back, and somehow never did until now. It’s one of those places where half the space is a deli/wine store, and the other half is a restaurant. The seating looks like the sort you’d find in a sit-down restaurant where waiters take your order, but in the front there’s a food counter and a pile of trays. I got kind of confused looking around, and couldn’t remember if the counter was just for take-out or what. Luckily some people came in at the same time as me, and confirmed that you take a tray, get your food served cafeteria-style, then pay and take your tray to a table. A bit later, I was near the door and an older couple came in, looking confused, and I graciously explained to them how it worked as if I’d been eating there every day for years. 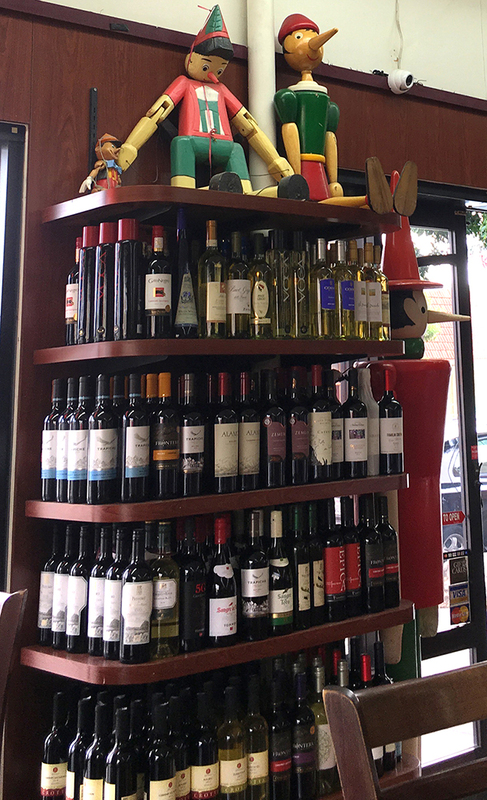 -When you walk in, to the right is the deli/wine shop, which looks fairly standard except there is a collection of Pinocchio-style puppets on high shelves near the ceiling. I wonder if they bought those all at once, when they first decided on the name, or if they’ve been collecting them over the years? To the left is the food counter and restaurant, which consists of three rooms in a row, all with hardwood floors and wood beams in the ceiling. The first room, which shares the space with the food counter, has lots of black tables and booths and a massive wooden chandelier and is sort of bustling and busy and like the kind of place someone might come every morning to read the newspaper. There are a bunch of pictures of old airplanes on one wall, and an old map of I think Italy. 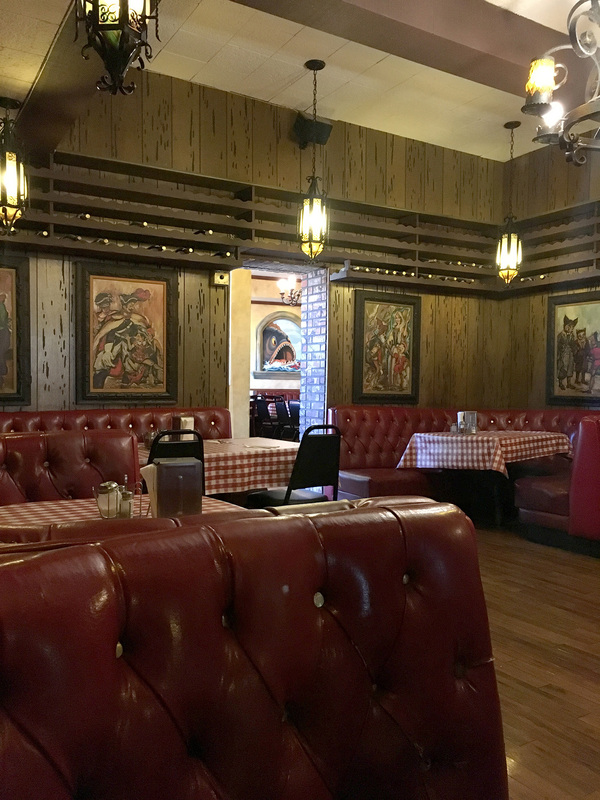 A brick archway leads to the second room, which is cozy and dim, with slightly scary oil paintings of the Pinocchio story, and round red leather booths and wine bottles on racks near the ceiling, and lots of brick and (I think fake) wood paneling and one wall made of corks and another wall painted red. It’s the sort of place people would go for a date or a business meeting. 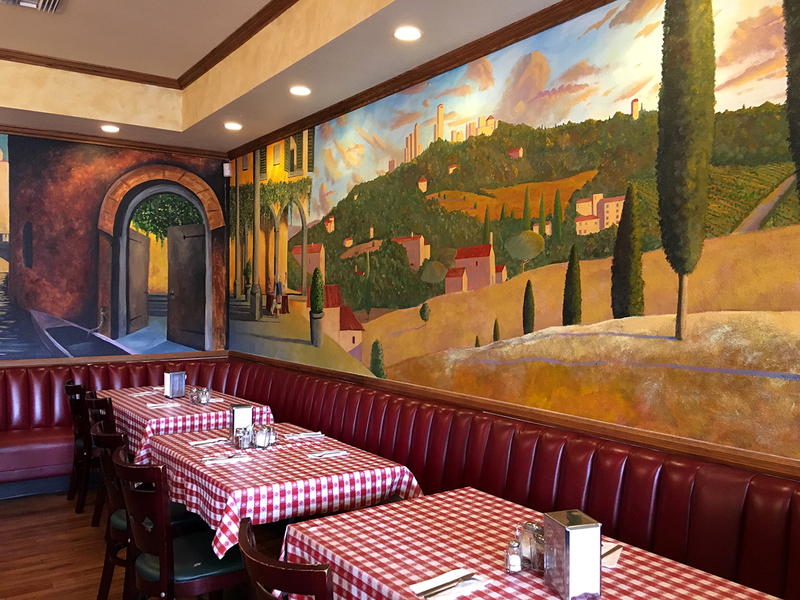 The third room is bright and cheerful and roomy, with amazing murals on the walls, some of a much more Disney-fied version of the Pinocchio story than in the previous room. It’s the perfect place for big families to come and be loud and happy, or for people to have birthday parties. There’s also an outdoor patio, attached to the room, where you can sit outside when the weather’s nice, which of course it usually is. -I got a small meatball sandwich, which was still very large, and it was delicious — great bread and just the right meatball/sauce ratio. It came with two salads, so I chose spinach and fruit. It all came on a divided plate, which I liked a lot, because I hate when my food touches. But then I realized that even with the divisions I’d be hard-pressed to keep the marinara sauce off the cantaloupe. I ended up doing something I’d never do if I wasn’t eating alone; I moved the fruit salad onto a napkin to keep it safe. -I got a bottled water because it looked like getting a refill of a glass of water might be a pain, what with having to go back up to the counter and maybe while you’re gone the bus boy might think you were done with your food and throw it away. It probably would have been fine, but anyway I got a bottle of water and that worked perfectly. -One of the women who had shown me where to get food was wearing a cool t-shirt with Leatherface on it. I don’t enjoy horror movies, but often enjoy horror movie memorabilia. I think it’s because when I was a teen so many of my friends loved horror movies; that stuff makes me nostalgic. Kind of like I never really got Monty Python when I was younger, but always enjoyed my friends reenacting Monty Python skits. -Mostly the music was Frank Sinatra and various friends of Frank Sinatra’s. At one point there was a song playing that I didn’t recognize, so I (very quietly) asked Siri what it was. She told me it was “Nobody But Me” by Lou Rawls. Seconds later, the man at the next booth said, “This is ‘Nobody But Me’ by Lou Rawls!” I’m 100% certain he hadn’t heard me; it was just one of those amazing coincidences. -A woman across the room from me spilled sauce on her shirt; at least I assumed she did by the way she was dipping her napkin in water and dabbing at it. But when she stood up, I couldn’t see any sauce at all. I was very impressed; when I try to dab water at spills it always just makes the situation worse. 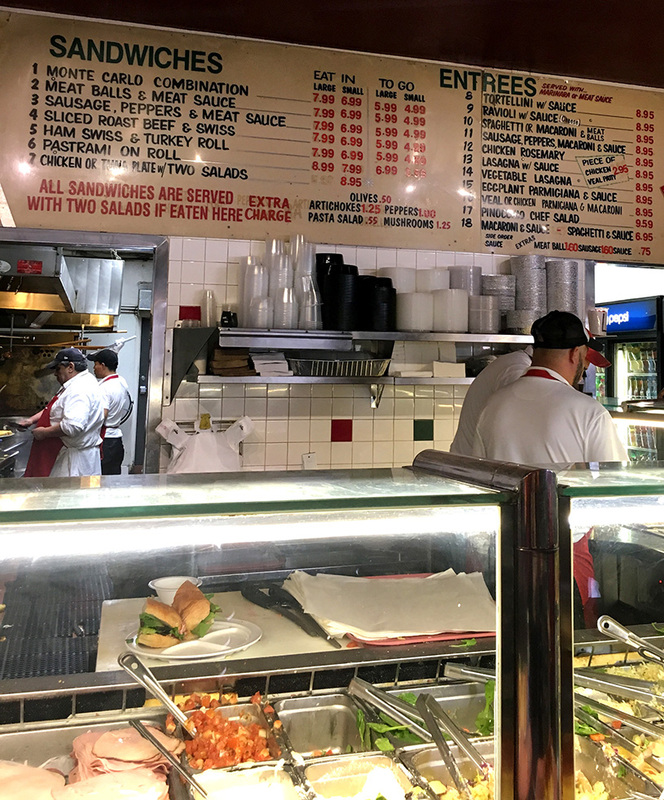 -In the second room, which also serves as a hallway between the first and third rooms, there’s a spot where the bussers put trays and dishes, and under the tray shelf is a pile of take-out containers for people to grab for themselves. I was sitting near it and heard at least five different people exclaim over how great it was. I now think every single restaurant should have that. -An older couple was sitting near me, and after they were done eating the woman got up and came back with a little dish of ice cream for her husband. I’m guessing husband; anyway it was someone she loves very much. Her obvious joy in bringing him ice cream, and the gentleness with which she put it down in front of him… She might as well have stood on the table and proclaimed her love at the top of her voice. It was incredibly sweet and I felt a little shy about observing it. -I was wearing a Buzzcocks shirt, and a 50-something guy who looked like the most stereotypical studio exec ever walked past and smiled and said “Love that band!” It made me very happy. That’s the thing about old punk rockers, like me and maybe him —they can look like anybody, so it’s extra nice when we spot each other. -There were napkins on the table, both under the sets of silverware but also in those little square napkin containers. You know the ones. Anyway, it was a good thing because my napkins kept mysteriously disappearing off my lap. I mean it wasn’t that mysterious obviously they were falling onto the floor, but why? I usually do an okay job of keeping napkins on my lap. 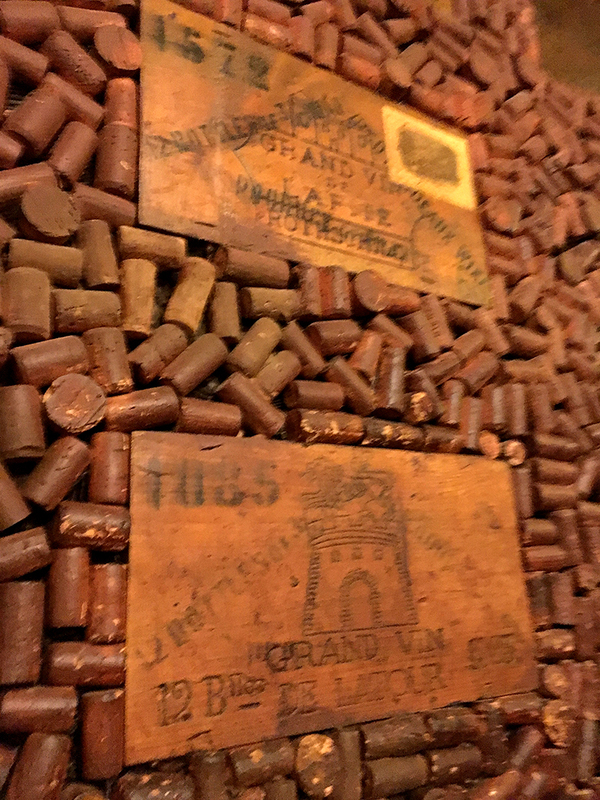 -I couldn’t tell if the wall was really made out of wine corks, or if it was just made to look like it was. David (my husband) once said it’s good to have a wall made of corks nearby because then if there’s a flood you can use it as a raft, but I’m not sure that would work. -A couple near me were arguing about pit bulls. The woman kept pointing out that it’s not the dog but the owner who is the problem, and the guy kept insisting that pit bulls are “just like that.” I wanted to yell over, “Your face is just like that!” but felt the woman was already winning her case with facts rather than hilarious burns, and left her to it. -It always seems so funny to me when people have cheap plastic cafeteria trays with fancy wine glasses on them. It’s definitely the sort of food that people who like wine would want wine with, and there’s a wine store that is part of the restaurant, so it all makes sense, but the wine glass looks so out of place. Like a chandelier in a garage, or something. -A well-dressed man came staggering through the room (I was in the middle room) on his way back towards, I suppose, the bathrooms. He was bumping into the doorframe and grabbing chairs to steady himself. At first I assumed he was drunk even though it was only 2:35 in the afternoon, but then I felt bad because maybe he was in some way disabled. But then he came back through and started yelling belligerently at his lunch companion and no, he was obviously just drunk. -One of the paintings on the wall of the third room is of that big scary whale in Pinocchio. I had a perfect view of it through the doorway from where I was sitting in the second room, but it doesn’t really look like a whale just a big fish, so it didn’t bother me. I am very scared of whales, and can’t really eat or even smile near big pictures of whales, but this one was fine. I know whale phobias don’t make a lot of sense but neither do most phobias so I’m not going to have this fight again. What I Read While I Ate: Heroine Complex by Sarah Kuhn; I’m reading it for the second time because the sequel has just come out and I need to be ready. What Sort of Ghost I’d Expect to Find if I Believed in Ghosts Which I do Not: A young woman who got a job at a movie studio right out of college. She thought she was going to make movies, but found she was treated more like a secretary. She started going to Pinocchio’s every morning for breakfast, to give herself a pep talk, and then every day for lunch, too, because she liked being somewhere where people recognized her and liked her, and didn’t ask her to get the coffee. One day she noticed another young woman sitting and making notes on what was clearly a screenplay. She liked the way this young woman worked, so serious and earnest as she marked up the pages. They were both regulars, and when it looked like the screenplay was just about done, she worked up the nerve to ask to read it. It was wonderful, and needed to be made. It took her a while, but eventually she invited her boss to lunch at Pinocchio’s and pitched it to him. He was cautious, but finally agreed to give her a chance. When the movie wrapped, she had a party to celebrate in the big back room — and had another party there when the nominations came in. 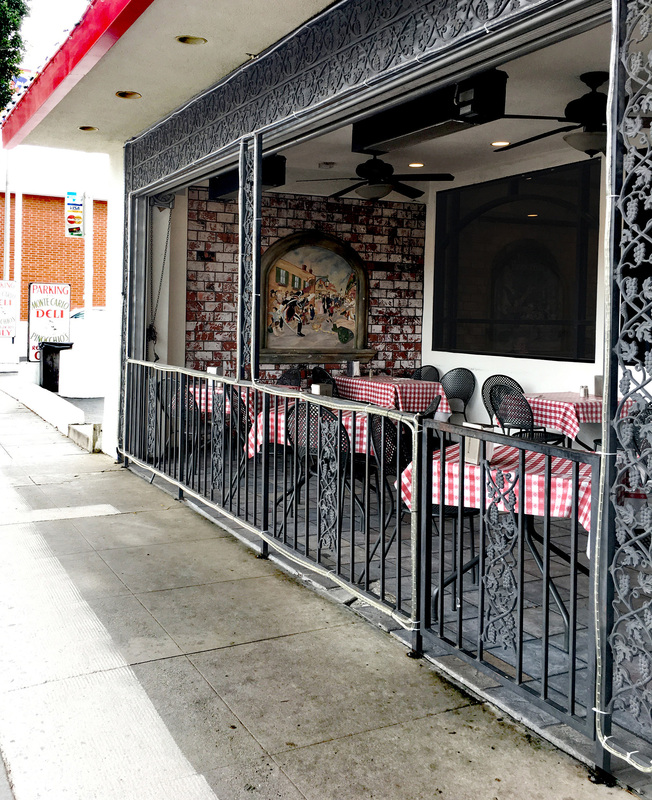 For the rest of her career, she thought of Pinocchio’s as the place that sparked her success. This is so compelling that I am sad I don’t live close enough to go eat there! And also I always forget that we both have the whale phobia. I am so glad I’m not the only one. Great post! Welcome back! I was on the fence about this place but next time I’m in the area I will definitely give it a visit. great writing…love this place. been coming here since it opened.